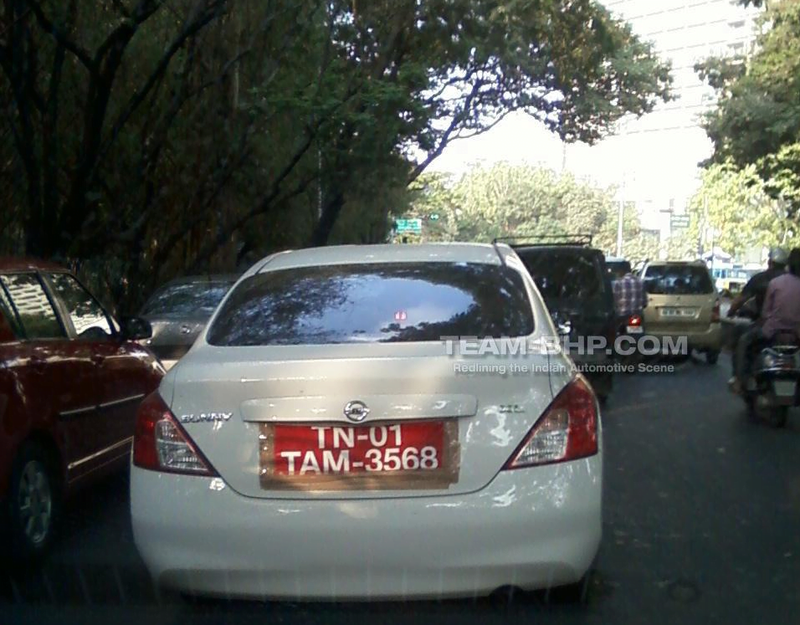 Nissan is testing Nissan Sunny CVT Automatic transmission car in India. A test mule on Bangalore roads has been spotted with CVT written over the window and temporary license plate with test badging. The Nissan Teana sedan which is the only automatic in Nissan India’s portfolio is the only automatic car which is also a CVT transmission car in India. Nissan Sunny sedan is a very competitively priced sedan in India and features class leading cabin space in its price segment. Apart from being aggressively priced, it has good feature set and comes in both petrol and diesel engine option. Though the Sunny may not be getting the deserved sales because of limited dealership and service network in India yet it is gradually picking up as I have recently started noticing on New Delhi roads more often than before now. The Sunny does not offer an automatic transmission variant in India as yet while the competing cars like Maruti Swift Dzire, Maruti SX4, Ford Fiesta, Skoda Rapid, Volkswagen Vento etc. offer a petrol automatic variant which may not be the highest selling variants, but they are gradually picking up and bringing new customers to the brands. With increasing stress on roads and hectic city traffic, automatics do provide some peace of mind especially in slow moving or stop-and-go traffic. Nissan Sunny Automatic India is expected to get a 4 speed automatic transmission gearbox already used in some other Asian markets as well. The Sunny Petrol is expected to get an automatic transmission gearbox while the diesel variant may not get is because of the reason why most entry level sedans don’t have diesel automatics, the cost factor. The Sunny Petrol is powered by a HR15 MPFI Petrol engine which produces a peak power of 99 BHP and a peak torque of 134 Nm. It delivers a fuel mileage of about 17 KMPL which is expected to go down to around 15 KMPL with a 4 speed CVT transmission in place. So far, the Sunny is available only with 5 speed manual transmission option in both diesel and petrol variants which start at a price range of Rs. 5.93 Lakhs ex-showroom Delhi for entry level petrol XE and goes up to Rs. 8.93 Lakhs for top end diesel XV. 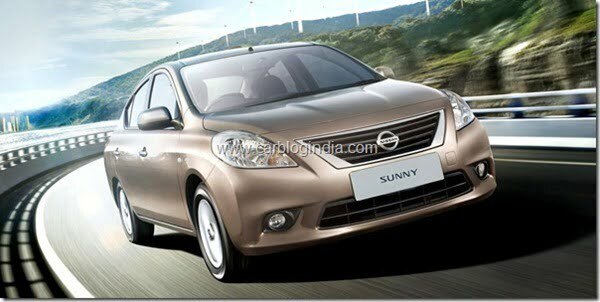 If the Sunny Automatic is launched in the mid level XV Variant, it is expected to be priced around Rs. 7.8 Lakhs ex-showroom Delhi for Sunny Petrol XL AT. The Sunny Petrol XL MT is priced at about Rs. 7.05 Lakhs ex-showroom Delhi in India as of now. Comparing it with some of the competing cars, the Dzire Vxi AT which comes under small car category is about one lakh cheaper at Rs. 6.54 Lakhs ex-showroom Delhi price. The larger sibling of Dzire, Maruti SX4 AT is priced at around Rs. 9 Lakhs while the Skoda Rapid AT is priced at Rs. 8.10 Lakhs and VW Vento AT at Rs. 9.2 Lakhs. This does mean that in the segment of spacious sedans, Nissan Sunny VL AT at around Rs. 7.8 Lakhs price tag is expected to be a very lucrative offering. We will keep you updated with the latest happenings, stay tuned for more by signing up for our official free email newsletter and like our official Facebook Page.